You are here: Home › Blog › Action Alert: Unite to Save the Scared Summits! Action Alert: Unite to Save the Scared Summits! Plans for major construction in the sensitive ecosystems of our most sacred summits continue to push forward, despite significant opposition from the community. 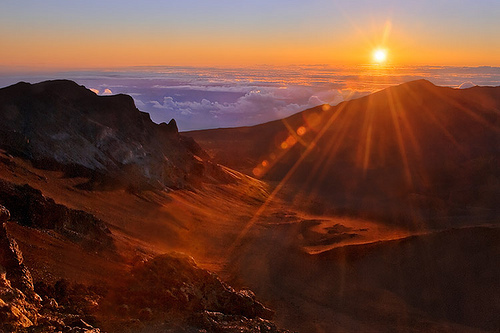 The University of Hawaii has filed two environmental impact statements — one for the world’s largest telescope in the world’s only tropical alpine desert, and another for a duplicative solar telescope in one of the most threatened national parks in the U.S. Both of these projects can be built in less sensitive areas. Though both summits are protected as conservation districts, where the law expressly discourages construction, the University refuses to compromise, insisting that these giant, intrusive structures be built where they will cause the most harm. Don’t let good science be used to justify unnecessary ecological destruction and cultural disrespect. Take action now to defend our sacred, fragile summits. Public hearings on the proposal to build the world’s largest telescope on Mauna Kea are being held now. All meetings are 5 to 8 p.m., with an open house in the beginning, followed by formal presentations, and then comments from the public. The Draft EIS is available on the Project website – www.TMT-HawaiiEIS.org – and hard copies can be found at public libraries throughout Hawaii. Get action alerts like these sent directly to your inbox by signing up with KAHEA’s action alert network at www.kahea.org. Empower grassroots efforts to protect Hawaiʻi with your donation today.